Making an origami golf club is a creative way to express your passion for sports. 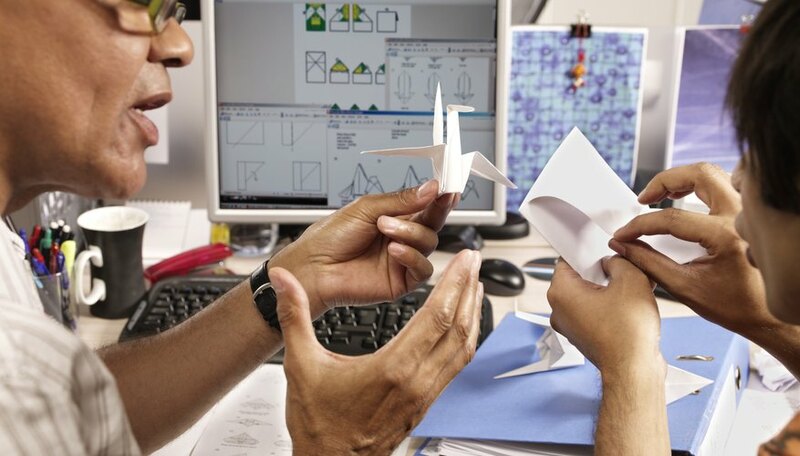 The purpose of origami is to turn a singular sheet of paper into a work of art. Origami is created by folding and bending the paper into life-like shapes, creatures and objects. The ancient Asian craft began as a formal exercise and has since become a passion shared by people from all walks of life, according to the Origami Resource Center. Once your paper golf club is complete, share your craft with family, friends and fellow golf enthusiasts. Place the paper onto a flat surface. Adjust the paper so one of the 8 1/2-inch edges is facing you. Fold the right half of the paper over the left half. Crease the fold. Always crease the fold. Fold the left half of the paper over the right half. Repeat this step. Your paper now resembles a thin, narrow rectangle. Adjust the paper so one of the short edges is facing you. Measure up 2 inches from the bottom right corner. Place your right index finger on the right edge of the paper at this mark. Pinch the bottom right corner of the paper with your left hand. Pull the corner up and to the left to create a 90-degree fold. Crease the fold once the bend meets your right finger at the 2-inch mark. The paper now resembles a capital letter L shape. Fold the short horizontal bottom edge of the letter L shape halfway under itself. Flip the paper over. Fold the left vertical half of the L shape over the right half. Your golf club is now complete.